Ok, I know, everyone knows how to start a fire, how to keep one going and what wood to cut or buy. It’s almost like an affront to someones manhood to even question this…. Truth is, I questioned whether I actually knew myself…..because from my own experience, the standard wisdom out there, didn’t seem so wise. So, after a lot of reading, research and experimentation, here goes. Man, I love a good fire…. 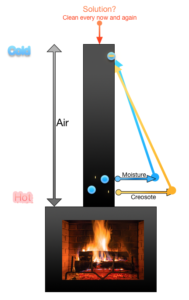 it’s dry, unique sort of heat, warmth, and it can really set a good mood 😉 and… Through years years my homestead, I found more of the “art” (and science) of perfecting this method of heat. These are the main elements to success: Fuel (wood), oxygen and heat…put your fire on a diet with any one or more of these and your fire will last longer or, if starved, will die out. A little science is important to frame my suggestion. 1.) The “Seasoning” of wood. 2.) Seasoned wood…. this does not mean dry. Seasoned wood has been allowed to sit for a while to allow it to evaporate SOME of the water within. 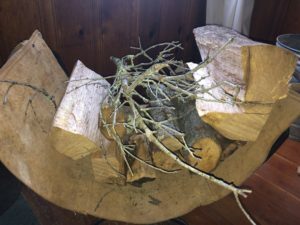 The jury is out about who long your firewood should sit and there are as many opinions on this as there are stages of wood from Green to wood dust. 3.)Creosote…. Oooo, spooky word which brings visions of your chimney catching fire. Ok, delete that image from your head and replace it with this information. Creosote exists in ALL wood. Seasoning your wood wont make it go away. When you burn wood, any wood, it off-gasses creosote. For this stuff to be a problem for you, you need to be lazy (meaning you don’t clean your chimney as needed) which, if you’re reading this, my suspicion is this will not be a big deal for you at all …. 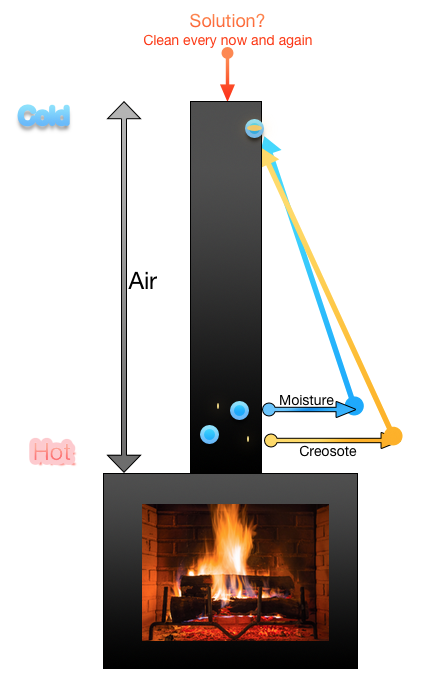 See, the more you dry or “season” wood, and as it burns in your firebox, the less moisture there is in the wood for the creosote to attach to as it cools and goes up the chimney (see the image to the left). 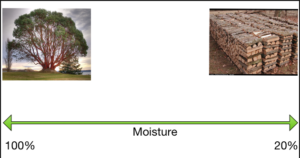 This mixture of moisture and creosote ALWAYS binds to your chimney…. even if its “seasoned” there is no way of getting rid of this fact. If the wood is more wet, there is just some more moisture for the creosote to attach to and will increase the amount build-up in your chimney. So, buying “seasoned” wood DOES NOT ELIMINATE CREOSOTE! It only reduces it. So, now you know creosote always exists and its more of an issue of moisture…. 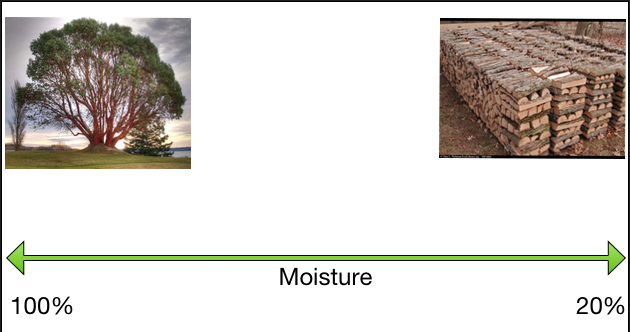 however, more moisture also allows for LONGER BURNING WOOD (Burning less logs = less creosote), I’m sensing you now understand….. It’s a balance just like everything in life. Add some less seasoned wood (Green) along with a couple pieces of more seasoned wood and you’ll get a longer lasting, very warm, almost smouldering fire. Selecting your wood. So many times, I hear people wanting good dry (seasoned) wood; swearing that Oak, Madrone or Almond is the key to long lasting high quality fires. I have to say, in my opinion this is a little misguided. I have burned about every kind of wood from the above to Eucalyptus, Redwood, Pine, and Fir and found all of it can work well if done correctly. 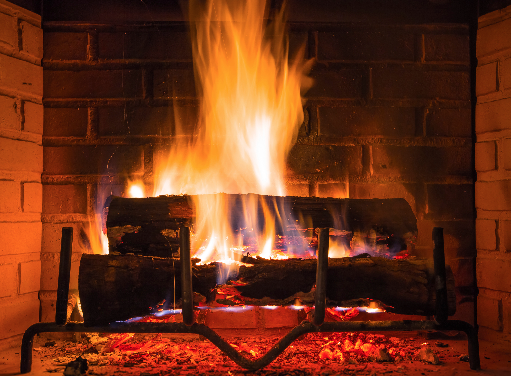 Instead of focusing on seasoned wood, choose very dry wood to get your fire started…small pieces, even small twigs are best. When a tree falls on my property, I keep even the twigs (perfect for starting a fire). Beginning your fire with very small pieces and graduating to larger and larger pieces to get a bed of coals and ash (the ash is an amazing insulator for those coals. So, do not remove all of that ash so quickly…use it for your benefit! Keep a couple 2-3″ of ash). Use well seasoned wood to get the fire to a bed of coals. Once you have a bed of coals on a2-3″ of ash, mix well seasoned wood with less seasoned wood. You’ll find a great balance. This video shows you how I manage this with mine…. So, select some wet (also called green) wood and add that to your fire….. you’ll like what you get! Remember to check your chimney a couple times a year for build up. Like anything else, it too requires maintenance. Cleaning it, is easy fast, and really inexpensive. ← “Wont You Be My Neighbor?” Fast, Easy Companion Planting.